Virtually the same formulation as OMAPURE™ at half the cost. 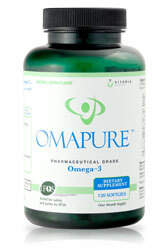 In fact, OMAPURE™ has a slightly higher EPA/DHA concentration (e.g. 70% EPA and DHA vs. Sear’s 60% EPA and DHA). OMAPURE™’s softgels are slightly smaller in size than Dr. Sears’, so the total EPA & DHA is almost identical for four softgels (2390mg vs. 2400mg). In terms of fish oil supply, both OMAPURE™ and OmegaRx are sourced from cold, pristine waters off of South America where there are less environmental impurities.